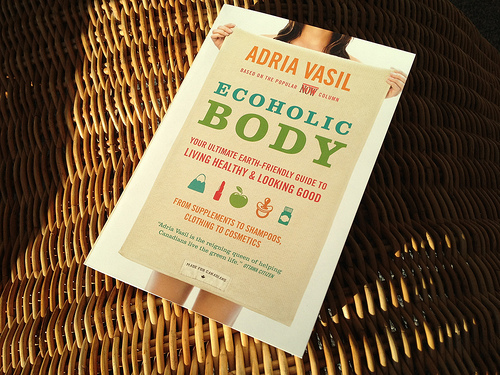 I’m very excited to be one of the very first recipients of my pal Adria’s newest book, Ecoholic Body! Based on her popular column in NOW magazine, this is the third Canadian book in her series (she also has an Ecoholic US edition). The book will be available in stores across Canada on April 17. This volume has been years in the making, through some very challenging trials and tribulations in Adria’s life, and it’s a testament to her devotion to the planet and all things sustainable. I plan to settle in here at the cottage this weekend under a cosy blanket and begin to learn about all the scary things out there that we slather on ourselves, that coat our fabrics and persist in our waterways after we flush them down the drain. While I’m no fashionista and my daily beauty routine takes all of about 10 minutes, I know there’s more I could be doing to lesson my footprint and to live a healthier, greener lifestyle when it comes to body care. So… here’s to gettin’ schooled by my very talented friend through her witty writing. If you want to check her out, Adria will be giving a NOW talk at The Drake Hotel on Monday, April 16, 5:30 p.m. ($10 admission). Previous Post Taking it national baby!